The primary operator of communications satellites in the Arab world has launched the first of two powerful new spacecraft, beginning a major orbital upgrade using competing commercial rockets to get the birds aloft this month. The Arab Satellite Communications Organization, or Arabsat, reaches millions of homes in over 100 countries across the Middle East, Africa, Europe and Asia, relaying hundreds of television channels and radio stations with its current cluster of geostationary spacecraft 22,300 miles above the planet. A new generation of broadcasting spacecraft for Arabsat took flight at 2200 GMT (6 p.m. EDT) Thursday, as the Badr 5 satellite launched atop a Russian-built and American-marketed Proton rocket from the Baikonur Cosmodrome in Kazakhstan. But it took nine hours to heave satellite into the proper orbit before a successful rocket flight could be declared by International Launch Services. "Our congratulations and thanks go out to the entire team for their tireless efforts and exceptional performance with this on-time launch on ILS Proton," said Frank McKenna, ILS president. The Badr 5 spacecraft will beam programming directly to homes, route broadband Internet connections, enable interactive television and increase the amount of high definition TV that can be sent to Arabsat customers on Earth. "This satellite will be the most powerful satellite in the Arabsat fleet," said Evert Dudok, CEO of Astrium Satellites. Built jointly by Astrium and Thales Alenia Space, the Badr 5 is a Eurostar E3000-style satellite with a 15-year design life and weighing nearly 12,000 pounds at launch. It's equipped with 56 Ku-band and four Ka-band transponders. Badr 5 is destined to join two older satellites at the orbital slot of 26 degrees East longitude over the equator. 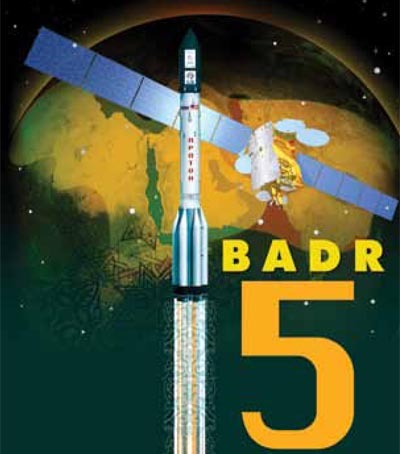 Badr 4 also launched on a Proton in November 2006 and Badr 6 rode a European Ariane 5 in July 2008. Badr means "full moon" in Arabic. In addition to providing redundancy to the two other satellites, the advanced Badr 5 will allow an expansion of services. Arabsat says the new craft can transmit more than 700 television channels simultaneously with other communications services like Internet offerings. "With its Ka-band capabilities and steerable antennae, it will allow to address a variety of markets and will offer sophisticated interactive services and HDTV to consumers," Seznec said. Ahmad Al-Shraidh, director of technical planning and developments at Arabsat, says Badr 5 is a "fantastic and most capable satellite ever launched for the Middle East." "I would like to thank all the people who have contributed to this effort that has been running for the past five years since we started the project," he added. Thursday's marathon launch began when the Proton's six engines ignited to blast the 20-story rocket away from Central Asia on two million pounds of thrust. The booster's three core stages delivered the Breeze M upper stage and the payload into an initial suborbital trajectory within minutes. The Breeze M then assumed control to conduct five burns over nine hours to methodically propel Badr 5 into the desired orbit for deployment. The targeted geosynchronous transfer orbit had a high point of 22,236 miles, low point of 3,598 miles and inclination of 19 degrees to the equator. The rocket released the satellite as scheduled at 0713 GMT (3:13 a.m. EDT) Friday. "This satellite was launched on-time with perfect execution and will support our leadership role in the providing telecommunication services to the Arab world," said Khalid Balkheyour, Arabsat president and CEO. The satellite's onboard engine system will complete the task of circularizing the orbit to an altitude of 22,300 miles along the equator in the coming days before it enters service. The Riyadh, Saudi Arabia-based Arabsat also has its Arabsat 5A telecommunications satellite at the Arianespace launch base in Kourou, French Guiana, awaiting liftoff June 23 atop an Ariane 5 rocket. That craft will be parked alongside the aging Arabsat 2A in geostationary orbit at 30.5 degrees East. Although the new Arabsat 5A is built just like Badr 5, it carries a different communications package featuring 26 C-band and 24 Ku-band transponders for business services and television signal routing. Proton and the Ariane 5 are the two chief competitors on the commercial satellite launching scene today, and Arabsat has contracted with both boosters to get its vital new assets safely into orbit. Badr 5 and Arabsat 5A are the first members for the organization's fifth generation of satellites. The original generation a quarter-century ago included one craft launched aboard space shuttle Discovery in 1985.